We recently returned from a visit with our Amish friends. 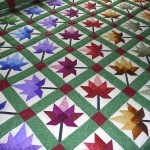 They had quite a few new quilts to show us, many of which were Radiant Stars and Lone Stars in Autumn colors of gold green, russet and orange. For the very first time we have a Maple Leaf pattern called “Autumn Splendor.” It is an arrangement of variously fall colored maple leaves, all pieced (no appliques), within a green grid. We also selected a wholecloth Feathered Pineapple quilt. We think it’s one of the most beautiful wholecloth quilts we’ve ever had. Words that come to mind when describing this quilt are elemental, evocative, minimal, tropical, universal and ingenious. 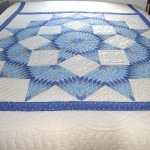 Also, have a look at this gorgeous light blue Broken Star quilt. Personally, I’d love to have this quilt on our bed. It’s a crystal clear, early twilights quilt. It’s incredibly soft because the artist chose unbleached cotton for the backing and for the open spaces of the quilt. 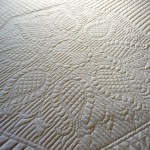 The surrounding hand quilting is unique, powerful and simple – wavy radiating lines.